From the smallest house mouse to the largest Norway rat, these rodents live wherever humans do. 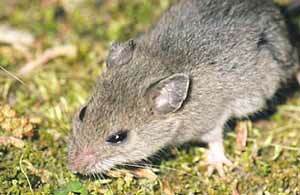 Rats and mice are active at night, while voles can be seen scurrying about day or night. These creatures love to dig and burrow, making them major pests of underground plantings in the garden. Partially eaten potatoes or carrots are a sign of mice and vole activity. They also devour newly sown seeds, and feed on most flower bulbs (except daffodils). Spring snowmelt often reveals bark chewed from the base of young tree trunks. The first line of defense is to create a mouse-unfriendly environment by removing food, water, and shelter. Seal pathways they might use to enter buildings, clean up pet food dishes, and keep garbage in secured bins. The most effective household control is the old-fashioned trap. Whether it be a snap trap or live trap, bait it with peanut butter or bacon and place it in mouse runways. In the garden, delay using fluffy mulches such as straw until late in the season. Mice love to winter over in this material and it gives them easy access to your plants under the snow. Repellents containing ammonium can be effective against rodents when applied as directed. Protect tree trunks with tree wrap or hardware cloth, making sure it reaches a few inches below the soil line and 18 inches high. Place precious bulbs such as lilies in metal cages or place sharp, crushed gravel around the bulb when planting to deter these tunneling pests.